Croatia is a popular tourist destination in Europe for its Mediterranean climate, impressive Old Towns, and vibrant nightlife. The peak season is during the summer months when you'll find plenty of fun activities and events going on throughout the country. In particular, coastal areas such as Hvar and Split can attract a lively and fun crowd. If you've come to Croatia to enjoy the party scene, then a hostel may offer you the most social setting. There are often other guests hanging around looking for people who are heading out on the town. Some hostels encourage a more social setting than others, so consider your priorities before booking. Some of the most fun and lively hostels in Croatia are listed below. 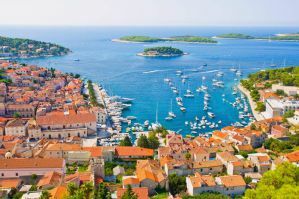 How much do hostels in Hvar cost? Split Hostel Booze and Snooze is probably the top party hostel in Croatia. The hostel is in a central location in the middle of Split's city center. It's just a short walk from most of the city's top tourist attractions and is near beaches, bars, and restaurants. The hostel is run by Australians who know how to ensure you have a great time. During the peak season between April and October they host a nightly dinner for guests and then everyone heads out on the town. It's easy to meet people and everyone is very inviting, so it won't be long before you join in the fun. If you're hoping to head to bed early, then don't stay here. If you're looking for a fun time in a social setting, then this is one of your best options in the area. The hostel also has all of the standard amenities available including free wi-fi, security lockers, an outdoor terrace, and all kinds of travel information. They also help organize trips to nearby islands. This hostel has dorms that sleep six, seven or eleven people. All rooms are co-ed. Villa Skansi is a quintessential backpackers hostel on the popular island of Hvar in Croatia. It's located amid all the action in the town of Hvar and is about a five minute walk from the city center and the area's best beaches. The hostel has a large bar that stays popular and a nice patio where many guests enjoy eating a meal and checking out the view of the ocean. There's also a large barbecue, an impressive kitchen, and plenty of places to relax. The hostel staff organizes a variety of activities for guests. There are pub crawls and a sunset barbecue. Many guests like to hang out late into the night sipping Mojitos and having fun. This is a fun and social place to stay where you won't have any trouble meeting other guests. If you've come to Hvar to have a good time and enjoy the area's vibrant nightlife scene, then this is the place to stay. Hvar Out's convenient location right by the famous Carpe Diem night club makes it an ideal place to stay if you plan on heading out on the town. It's located on the main promenade and is near many of the area's best beaches, bars, and clubs. If you plan to stay out late into the night, then you won't have to stumble far to get back to your room. The hostel also has any number of amenities and activities for guests. There are scooter rentals, island excursions, and fishing trips that take you to a popular full moon party. The staff know everything that is going on in the area so you won't miss a party. Most workers are travelers themselves and they know where you'll want to go to have a good time. The standard amenities are available here as well including free wi-fi, security lockers, travel information, air conditioning, and hot showers. There's also a rooftop terrace where guests can relax and enjoy a few beers as the sun sets. There are always other guests hanging around and it won't be hard to find someone to head out on the town with. Both private rooms and dorms are available. Private rooms are all twins and dorms sleep four, six, or twelve people.